The goal of the initiative is to expand the idea of empowering youth to improve their communities throughout the Wyoming School-University Partnership and eventually across the NNER. Pinedale High School, Worland High School, and Torrington Middle School participated during the 2011-2012 school year. All three schools presented with the Partnership's project facilitator, John Anderson, at the NNER conference in Denver, October 18-20, 2012. Read about their projects by clicking here. John Anderson (pictured to the right) is a current resident of Pinedale, Wyoming. He returned to his home state after a 30 year teaching career, that began at the Wind River Schools and was completed after 18 years at the University of Nebraska at Kearney. 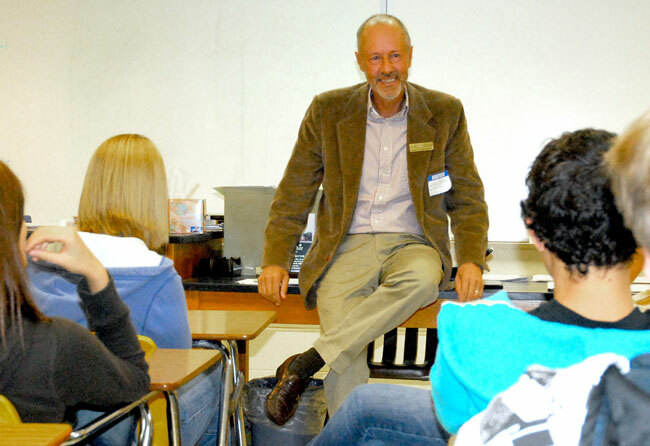 AT UNK, John was a Political Science professor who focused his scholarship on making democracies work in communities. Much of John's work included looking at the role of education in a democracy. Professor Anderson has also been involved in the work of the National Network for Educational Renewal and is currently an Agenda for Education Scholar. He began working with students and schools to bring about changes in communities through student engagement in Nebraska, where he and his colleague, Peter Longo, engaged seven different school districts in community or school improvement projects. During the 2011-2012 school year, John was the project facilitator for the Partnership's school-community engagement initiative.